MAD-81s, Tornado F50 hovercraft model is a 1-2 person hovercraft designed with simplicity and high weight-to-power ratio in mind - all at an affordable cost! It is available as a turn-key and fully functional hovercraft delivered to your home, or in kit form - DYS, Do It Your Self. Hunting, fishing, surveying, crossing swift waters, lakes, rivers, rapids and recreational boating are among the most popular reasons to own a MAD hovercraft. Our craft will allow you to navigate through areas you never would have imagined you could go. Flying a hovercraft is a truly unique and one of a kind experience that every person should be able to enjoy. 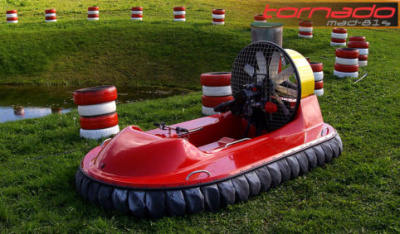 Tornado F50 Hovercraft are 2 person high performance hovercraft, ideal for personal use, racing as well as professional use, widely used in hovercraft rental business. You will be sure impressed by its performance. Tornado F50 can handle most extreme conditions with ease. And have no fear. Hovercraft hull is unsinkable and you are safe and sound on board MAD Hovercraft. With 200 lit. in-built flotation all around hovercraft bottom hovercraft safely floats like a raft when motor is switched off. You can use Tornado F50 Hovercraft for longer stops on the water for fishing let’s say, hunting, works,… etc. Not to mention Tornado F50 hovercraft is the only 2 person hovercraft on market with guaranteed flotation and unsinkable hull under full payload 200 kg on board. Can you imagine swimming in icy lake in worst case scenario? With MAD hovercraft this option is excluded. 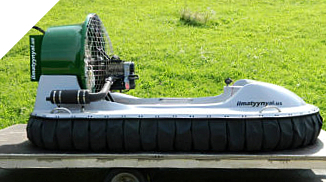 Tornado F50 hovercraft are available in many different colours and various types of engine in different output powers. Tornado F50 hovercraft are equipped with dry storage place for storing your cell phone device, wallet, car keys, or documents, during the hovercrafting. Beside turn key hovercraft we also sell and ship worldwide partly assembled DYS (Do it Your Self) kit forms for home builders. Contact us for more details.